Franco's Barbering Lounge | What are the best men’s hair products in Bristol? One of the most common questions clients ask us is What are the best men’s hair products in Bristol? Our team of Gloucester Road barbers have firm favourites that consistently deliver awesome results for all types of men’s hair. Our top trio of men’s hair products above represent three of the best hair products for men available in central Bristol, and our barbering team find themselves coming back to these product time after time in-salon. This superb styling product primes the hair to give light hold and texture, while also delivering fuller, thicker-looking hair and volume, and has been one of the best-selling men’s styling products we sell. It’s also a unique pre-styling foam with a medium hold and a neutral finish. To find out more about this product, please visit here. 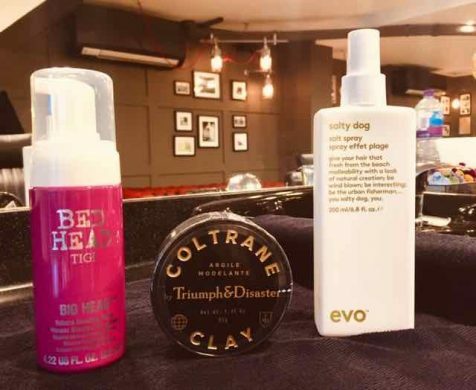 Triumph & Disaster have been providing some of the best quality men’s hair products at our Bristol barber salon for a few years now, and their Coltrane Clay is another superb addition to the range. Simply work a small amount into dry or damp hair and leave for the day. It contains gorgeous ingredients, including china clay, beeswax and Pracaxi Oil from the Amazon as a conditioning agent. Brazil Oil delivers extra hair hold. EVO have produced consistently-solid and workable hair products for men, and our clients love them. Salt Spray has been a firm favourite for years. This product is a mist that delivers a beachy, tousled texture with a matte finish. A simple and easy-to-use styling product for Spring and Summer. All of our clients get a full and free hair consultation – this includes advice on the best hair products and styling products to use, based on the client’s hair. To book any of our team of Bristol barbers online, please visit here. To keep up-to-date with the latest men’s haircuts and male grooming from our team of experienced Bristol barbers in-salon, please visit our barbering blog here. To find out more about our barber salon in Bristol, contact us here.